The weather has been insane here for the past week. The roads have been closed much more than they have been open. In fact my husband was unable to go to work even from Monday until Thursday when he was finally given permission to go to work even though the roads were still closed. Needless to say cabin fever was definitely an issue around these parts. While I did still cook for us during our weather imposed snow in, it was comfort foods that we craved such as my Hearty Kale & Potato Soup which I made a double batch of, and Galley Mess (a simple breakfast casserole that I will share with you soon). I did attempt to make Shirley's Sweet Potato Biscuits and although they tasted fantastic they just didn't work out for me as biscuits at almost 7,000 ft although they did just fine in an 8x8 baking dish! 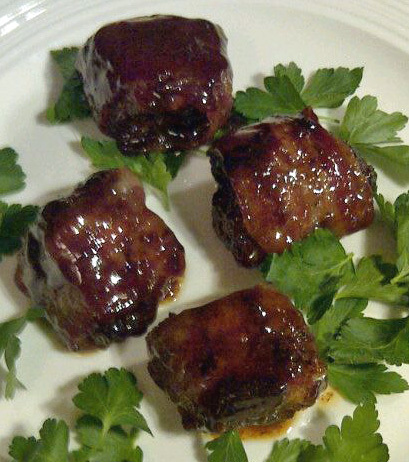 These Sweet & Spicy Bacon Wrapped Bites are naturally dairy free and gluten free which makes them perfect for me and my food allergies. Cut the pork or chicken into bite sized pieces. Cut your bacon into halves or thirds depending on the size of your pieces of meat. You want the bacon pieces to be long enough so you can wrap it around each piece of meat. In a medium bowl, combine the dry rub ingredients. Toss the pieces of meat with the dry rub. Be sure to get the meat well coated. Lightly spray the foil with oil. 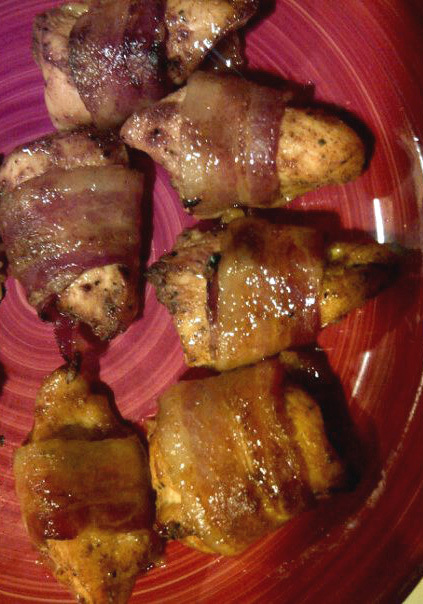 Wrap each piece of meat with a piece of bacon and place on the prepared baking sheet. Pour some sauce over each piece of bacon wrapped meat. Bake at 400 F for approximately 30 minutes or until the meat is cooked through and the bacon has crisped. About every 10 minutes during the cooking time carefully spoon the sauce back up over the meat to get them well glazed. OMG!! These are divine!! We made these earlier to take to a potluck. I never know what I'll be able to eat at these things, so I like to take something substantial and yummy so I can munch off of whatever I brought and not worry about allergies. Well, these were such a hit that I didn't get much to eat at the party, lol. 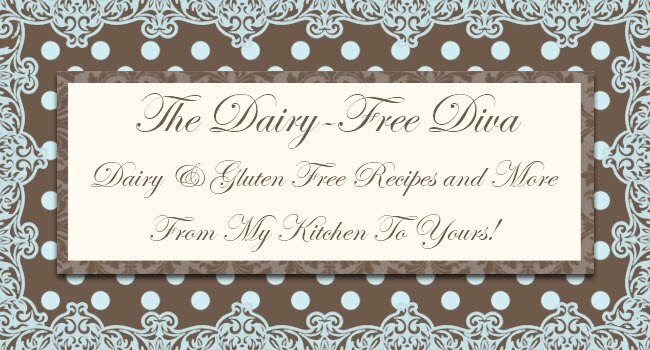 Thanks for posting so many wonderful df/gf recipes. I can't wait to make more of your amazing recipes!